The big Boeing 707 plane flew steadily through the night, non-stop from New York City to famous and beautiful Rio de Janeiro in Brazil. I was on my way, at last, to what I felt God had been preparing for me. Back in the country church of my childhood in Missouri, through the words of a missionary to India, I first heard God’s quiet voice urging me toward serving in overseas mission. That call intensified through my teenage years. In college I met and then married Erwin Rempel, who shared the same interest. We thought the overseas “mission field” lay straight ahead for us as soon as he completed seminary. 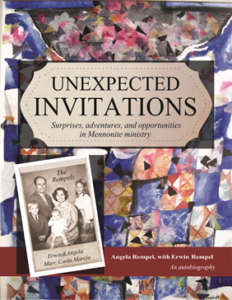 However, some unexpected invitations came – tempting detours or part of God’s training for us?